Here’s another way to cook the classic Thai family restaurant favorite: Pla Nueng Ma-Nao (ปลานึ่งมะนาว). Cooking this dish en papillote (in a parchment bag) does not add anything to it in terms of taste; it does, however, make for a great presentation when you entertain and lend itself as a practical solution for the time when you have just a small piece of fish to cook for one person. 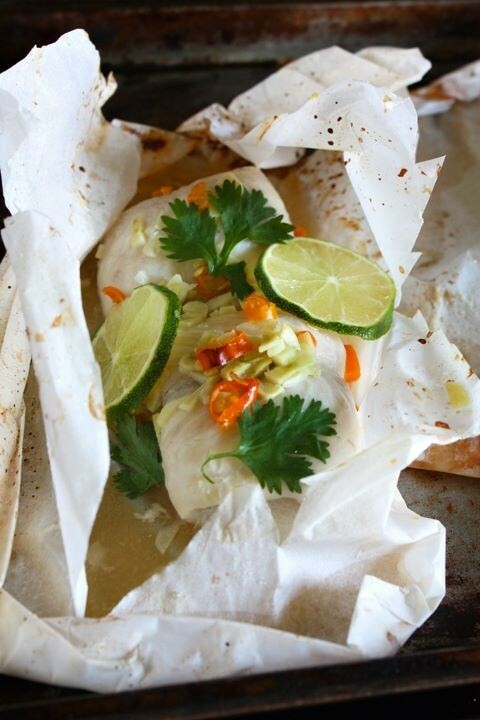 Simply follow the recipe for steamed fish with lime, garlic, and chilies. Instead of placing the fish in a heat-proof dish and cooking it in the steamer, bake it in a parchment paper packet (you can follow the step-by-step instructions here. As always I love your recipes. This is a good one for today’s lunch.